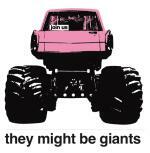 Monday, Jan. 30th, it's They Might Be Giants at The Rialto Theatre with doors open at 7pm with Jonathan Coulton. Both TMBG and Coulton are planning to stop by for special live in Studio 2A performances during The Home Stretch, Monday on KXCI! Brooklyn's alternative rock pioneers They Might Be Giants' barn-storming live act returns with a brand new show. Spirits will be high as the band celebrates the release of their brand new 18-song album Join Us and their 30th year of uninterrupted rocking.